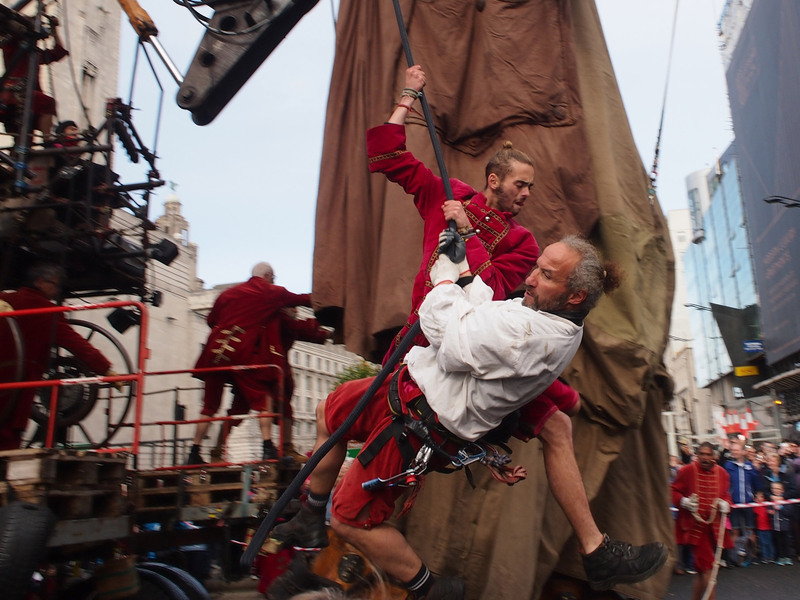 Theatrical magic-makers Royal De Luxe have been defying expectations about arts and culture for decades. 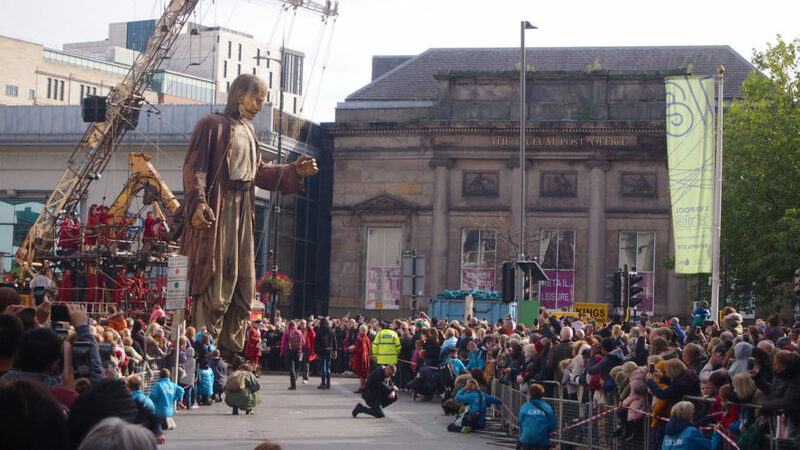 On their third trip to Liverpool, hundreds of thousands of people lined the streets to wave goodbye to the Giants. Board member, Michael Smith was there for the spectacle. Last weekend I travelled with my family to Liverpool. We had an astonishing couple of days bearing witness to a city under the spell of theatrical magicians. 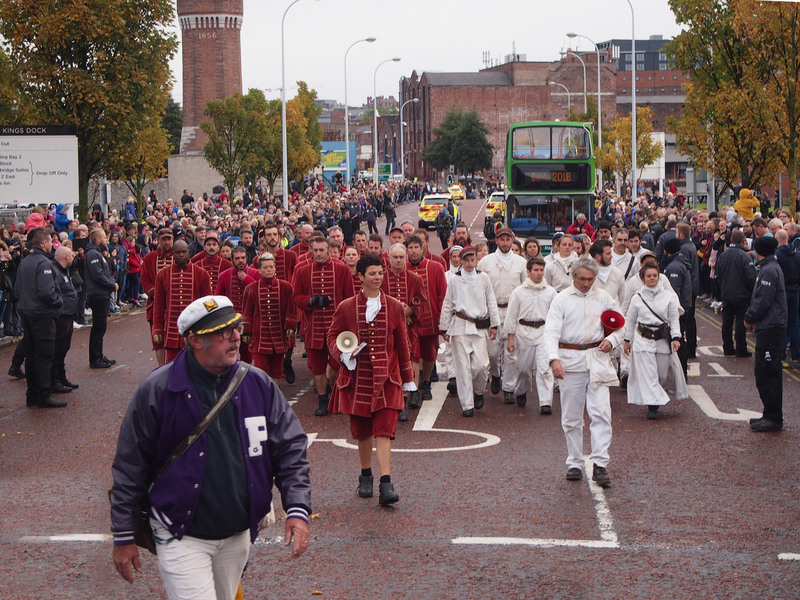 On Sunday morning we rose early and walked through the city centre towards the docks. Like a quirky filmic musical, people appeared from every doorway to join us. A handful at first, then dozens, then hundreds. Down every side street we glimpsed the streams all flowing in the same direction. Couples, family groups, buggies, wheelchairs and zimmer-frames; all ages, all shapes; chatting, excited, in a hurry. The streets must have flowed like this when the docks made Liverpool one of the busiest trading ports in the world. Except we weren’t all able-bodied men there to haul cargo, we were all-sorts there to marvel at the arts; we were there to watch puppetry. How many of us imagined that would be something we’d do on a cold Sunday morning? 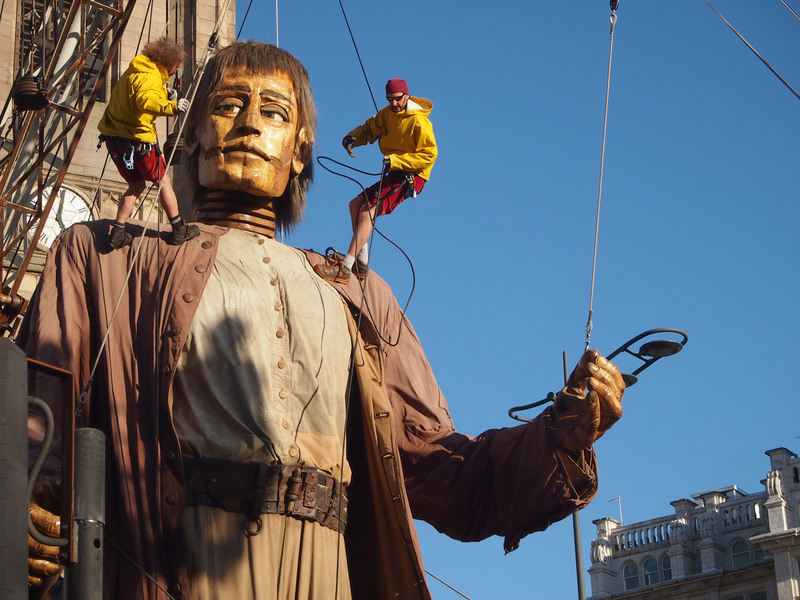 Hundreds of thousands of people lined the streets all through the weekend to catch the occasional sight of a French theatrical company that has helped to transform this city. This was the arts, writ very large but I doubt many people thought of it that way. We watched the Little Boy sleep, wake, walk and stare in wide-eyed wonder at the world. 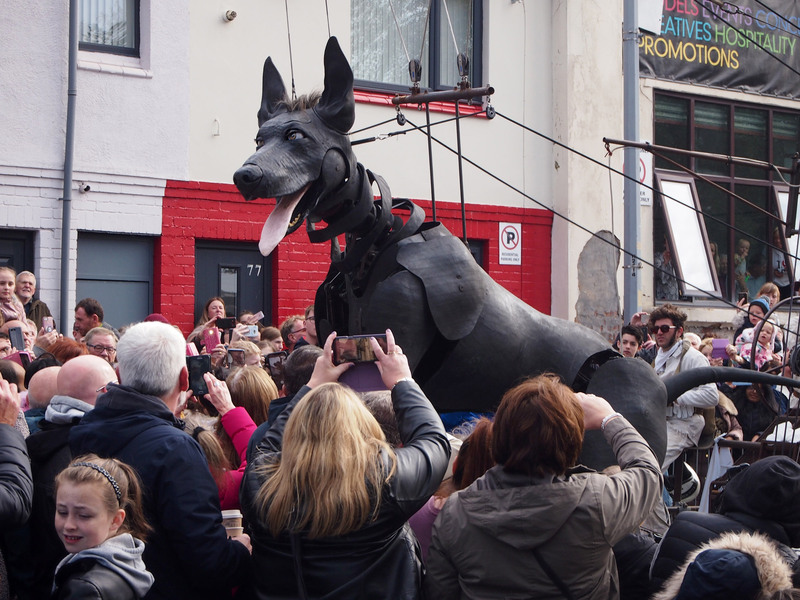 We saw the dog, Xolo, playing with the crowds, drinking from a bowl and running around roundabouts. And we experienced The Giant, towering 50ft above us, striding in from another world. 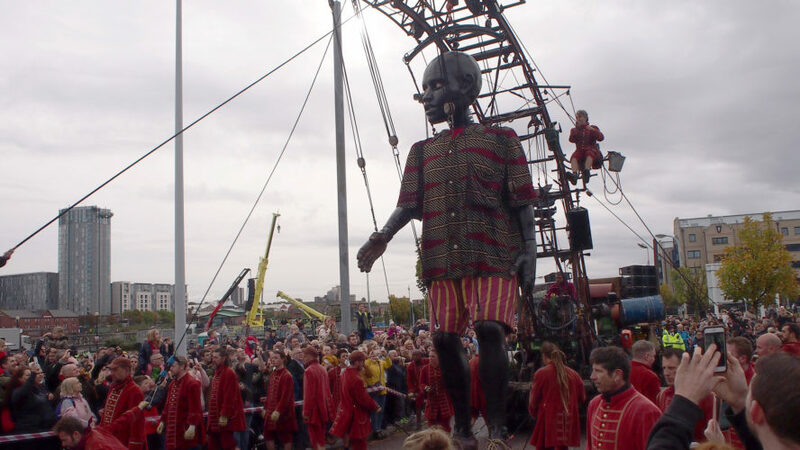 Controlling them all were the Lilliputians: the impeccably dressed and unerringly disciplined troupe of French men and women whose physical strength propelled these enormous marionettes with such grace and humanity. There was a narrative woven around them but I’m not sure many of us really followed it. The characters were enough for us. 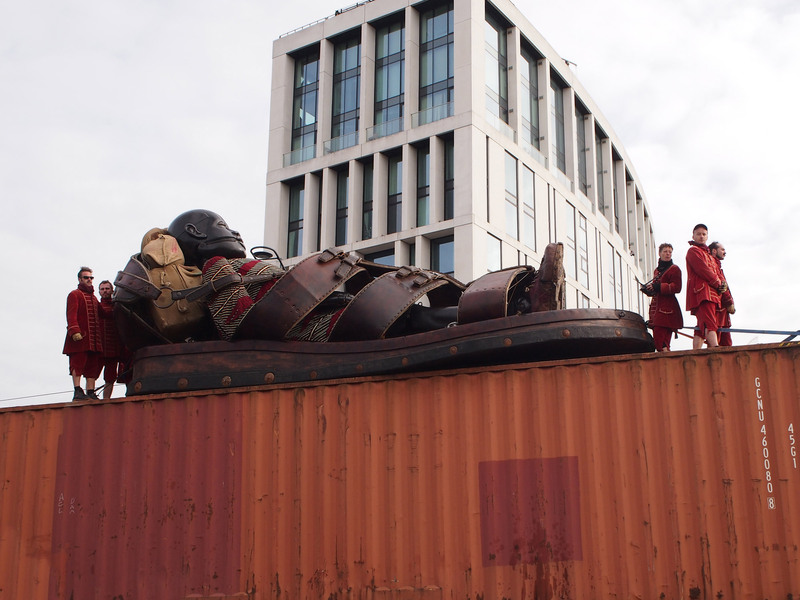 Liverpool’s Dream, as it was officially billed, was the third visit to the city by Royal De Luxe. Artistic director Jean-Luc Courcoult has described it as his finale, a goodbye to the city that has given him such a warm welcome. 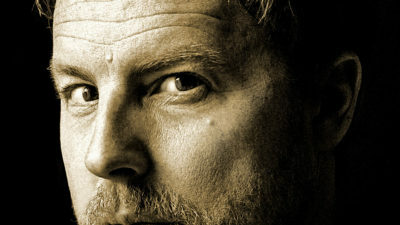 Maybe that is true, maybe it’s another part of the mythology that has grown around him. Liverpool was European City of Culture in 2008 (Brexit means it is last British city to be given that opportunity). That initiative was a huge success and the massive inward investment through EU grants, culture and tourism is cited as a key reason why the city has weathered the storm of the resulting years of economic recession. 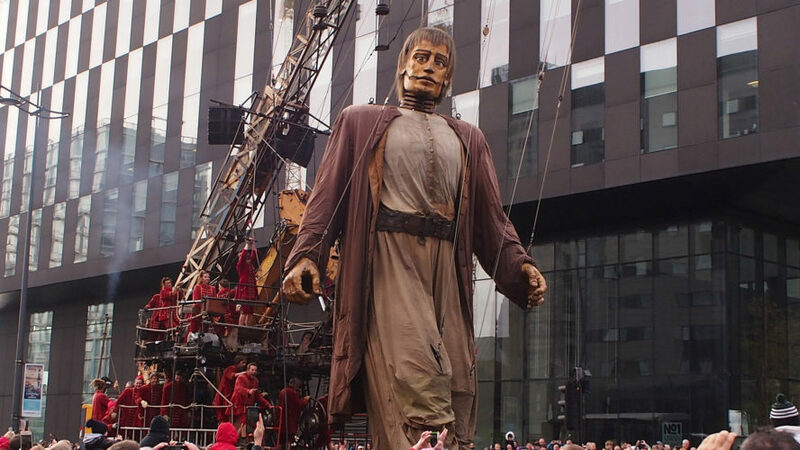 In that year, Liverpool saw its first ‘Giant’. 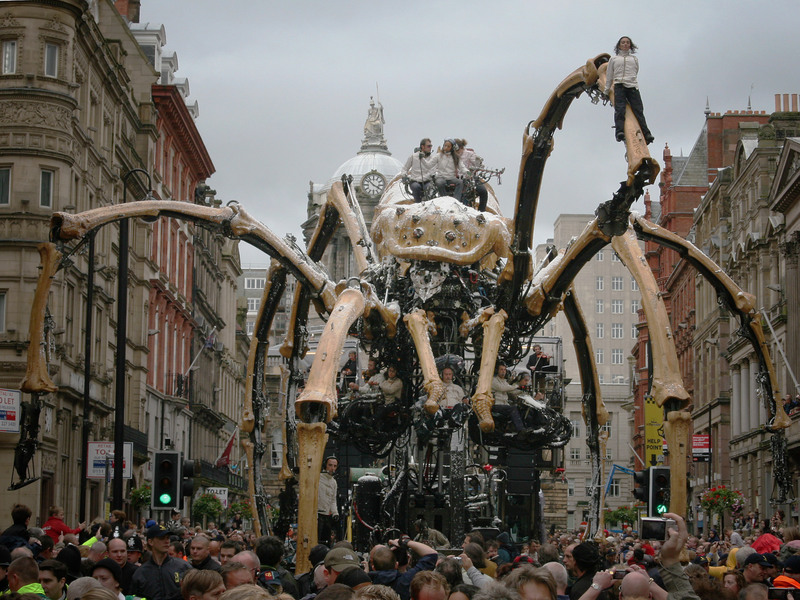 La Princess (above) was a gargantuan spider built by La Machine, a company led by François Delarozière who had recently set up on his own after years as a key player with Royal De Luxe. 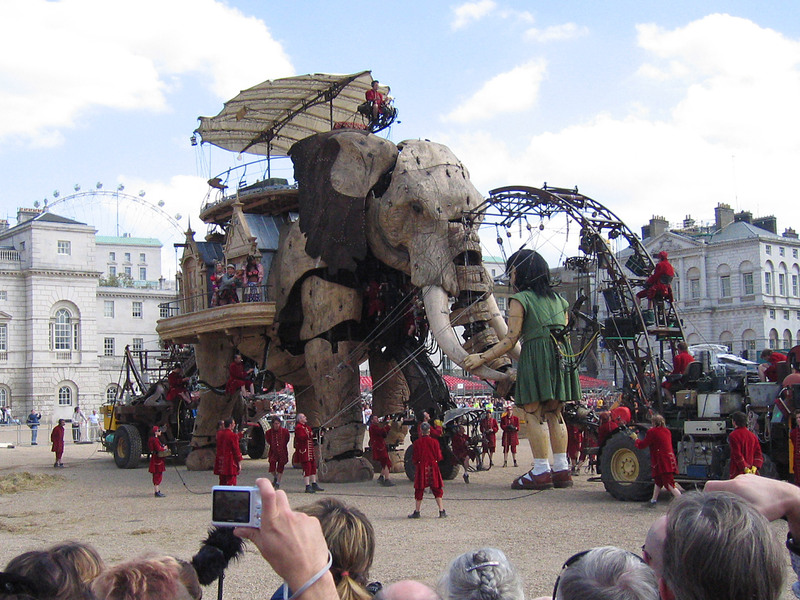 Delarozière was the engineer behind the astonishing Sultan’s Elephant (above) who came to London in 2006. That show broke every record for public investment, public participation and benefit. I’m not alone in arguing that without that show, London would not have staged the 2012 Olympics. A decade after Liverpool ’08, very few of the crowd care about the politics or history of it all. Why would they? They’re here to witness the spectacular, to connect with the extraordinary, to build memories. These are the moments that will shape their own story; these are the tales they will tell, they will become their family’s myths and tall tales. And, of course, these are images that will fill their social media feeds. Sunday was the last day of the long weekend of Liverpool’s Dream. The day before, I’d stood in the middle of a six lane highway, filled and overflowing with happy people as The Giant strode amongst us and stopped for a drink, delivered from a fire-hose. This extraordinary photo is courtesy of James Maloney/Liverpool Echo. Can you see me, close to The Giant’s right hand? 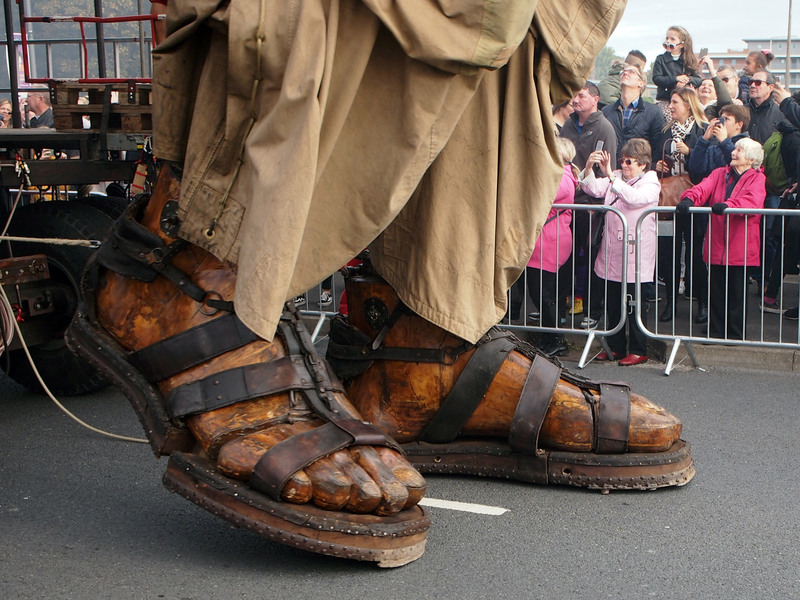 Today we all watched with sadness as he waved goodbye to the Little boy who floated away on a huge sandal, and we chased through the streets to keep up with Xolo and The Giant; one of the most thrilling ways to experience the event. As the pair settled in to their siesta (the very French company always take a two and a half hour lunch-break), I made my way back to the Salthouse Dock which we understood would be the scene of the finale. Waiting there I spoke with a group of women who’d travelled for the day, from near Blackburn. 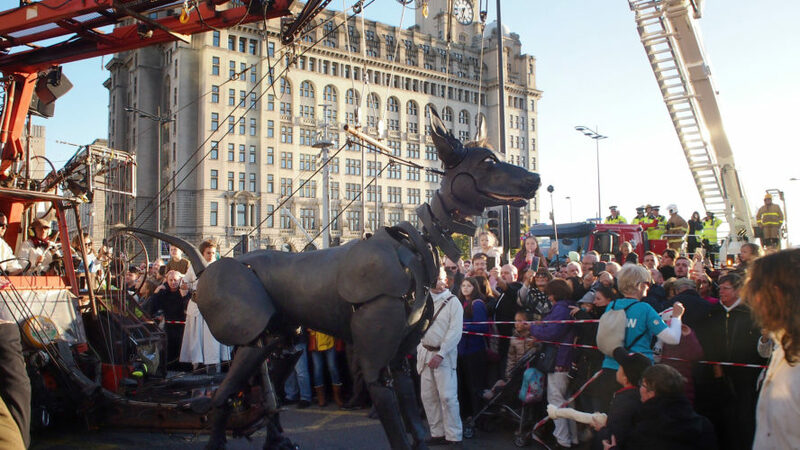 This was their third Royal De Luxe show in Liverpool. Through conversation I heard more about how these ‘free’ performances have changed their perception of this city. They’ve returned countless times with each of their families to see expensive shows in arenas and theatres, they drink in the bars and cafes, they eat in the restaurants and they shop and shop and shop. “When you go home, how will you describe this to your friends and family?” I asked. The crowds swelled until every inch of pavement, every raised surface, and every high-rise balcony was filled with excited bodies. In the distance we could hear the music, on the roof-tops we could see the camera-phones all pointing in one direction. The Giants were coming. Between the children on shoulders we could make out The Giant in the far distance, confetti cannons blasted to announce his arrival. This was a parade. And who was with him? It was the Little Girl, a character we’d first seen in London, searching for the Sultan’s Elephant. 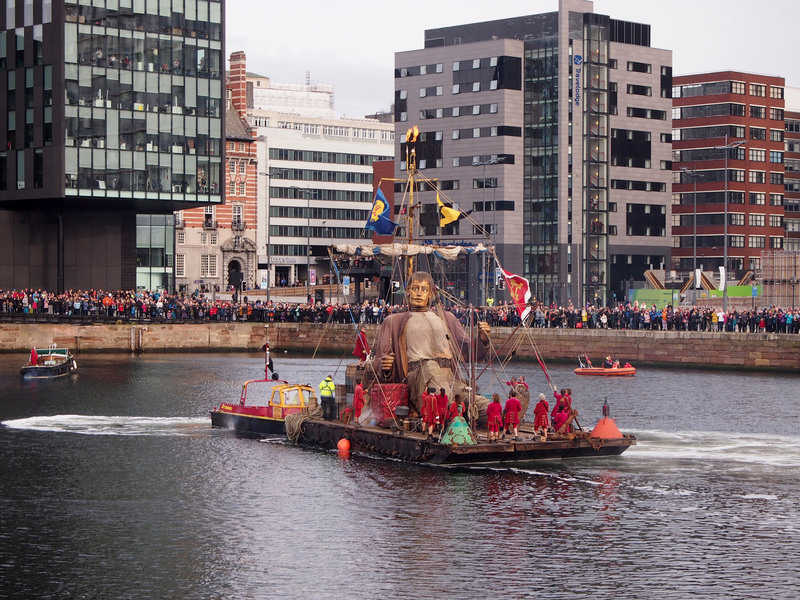 She’s been back to Liverpool for each visit but the crowd didn’t know she was coming this year. People gasped and cheered and applauded her sight, welcoming home their emigre child. As the pair reached the dock the music swelled and so did our emotions. 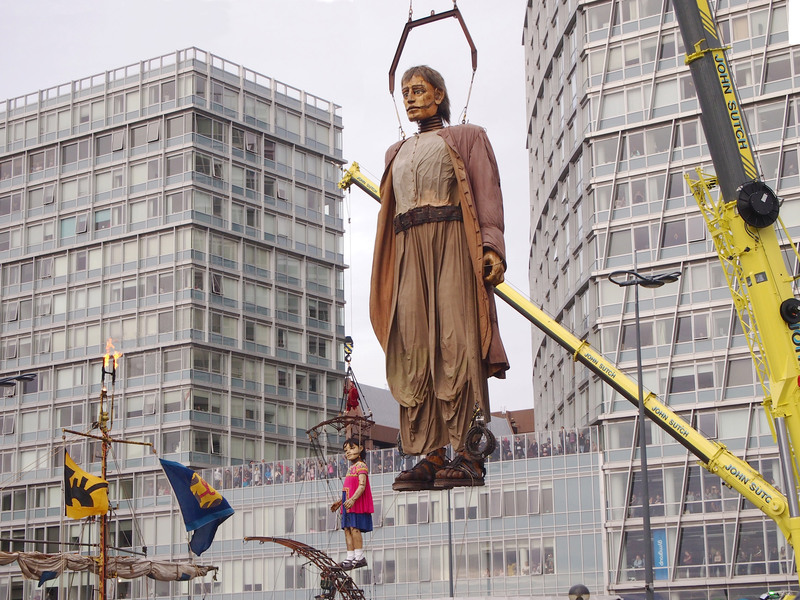 The Giant and the Little Girl were lifted high in the air – he onto a raft in the dock, she onto a deck-chair on the back of a truck. Tears were running down the faces of people around me (I might have had something in my eye). We all knew this was not au revoir. Goodbye Little Girl, goodbye giants. 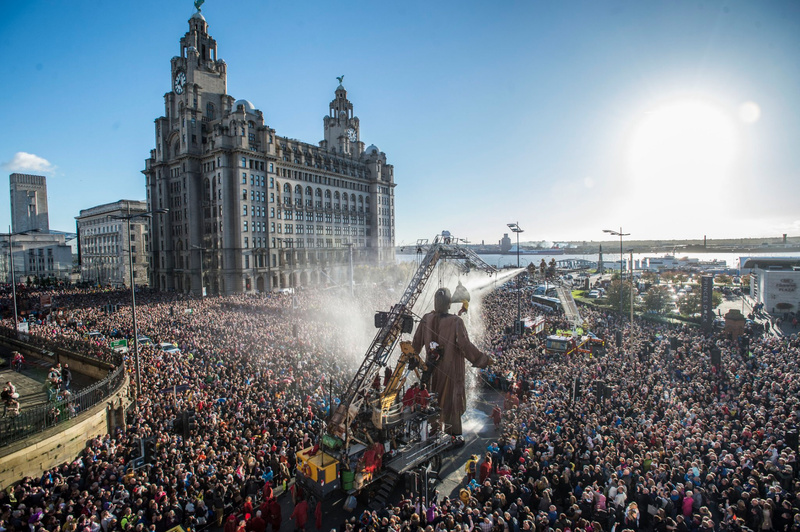 It’ll be a while until anyone is able to tot up the figures from this weekend but previous shows have been said to have benefitted the city by tens of millions of pounds in direct revenue from visitors, and in the enhanced reputation for the city as a location to live, work and invest. 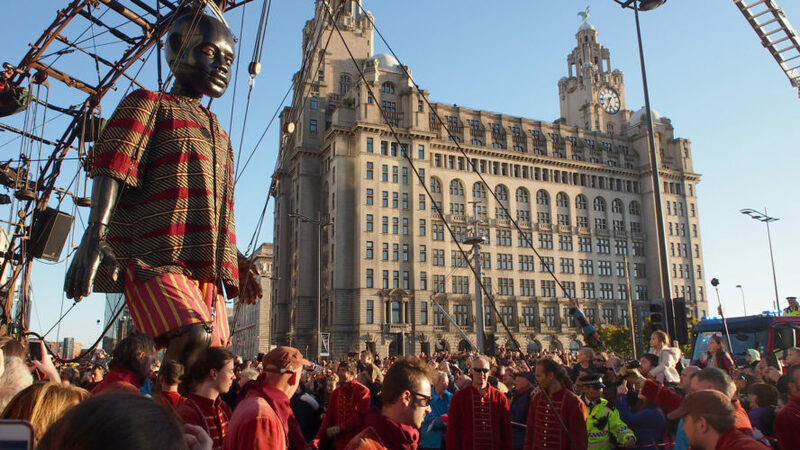 Of course that financial argument is important – if the city brings in multiples of the cost of putting on the show then it has more to spend on looking after the people of Liverpool (and investing in the arts so the UK might produce its own hugely successful cultural exports). But the wider impact will surely be felt by the hundreds of thousands of happy people, and by the individual stories they will carry with them. Who knows how each of their lives may be enhanced by this collective experience? Who knows what one, or two, or a hundred, or thousands of them may be nudged towards doing more creatively, or with more empathy, or with a touch more humanity, because together we saw the tenderness of a 30ft Little girl, reunited with her 50ft uncle in the Liverpool docks? 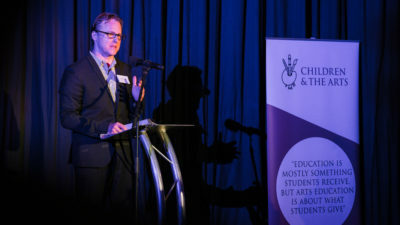 At the National Campaign for the Arts we believe in the positive power of the arts to change lives. We campaign for more public funding because we know that is a wise investment – we know because we’ve seen the faces of people who have been touched by giants. If you agree with us then Join Us and support our campaign. Processions – a living, breathing, chanting work of art.